ITC Kakatiya’s executive chef Rakesh Ghai, now has a set of regulars from the city who come to taste his dishes rustled up with a hint of desi tadka. “I started experimenting in the kitchen with various ingredients at the age of 14,” says the chef, who has mastered traditional Indian and Bukhara cuisine. Also, he has cooked for Bollywood celebrities Shah Rukh Khan, Aamir Khan, Akshay Kumar and even the Dalai Lama! Talking about one of his much-loved dishes, Maas Ka Soola, for which he shares his recipe, he says that he first tried his hand at the dish way back in 1992. 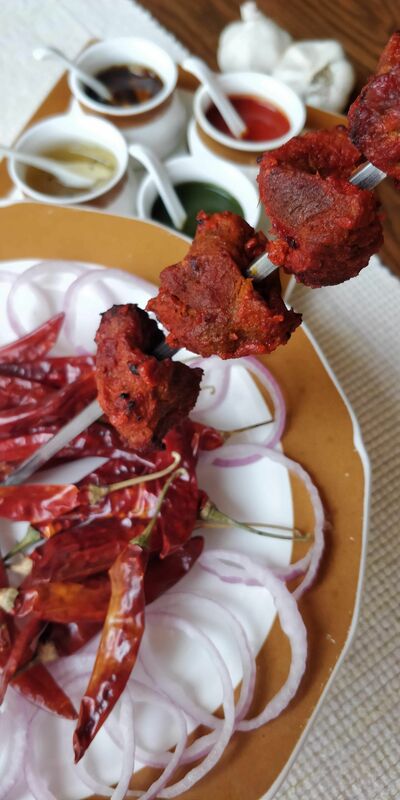 “This popular starter from the Rajput cuisine was originally made from game meat and its bright red colour is achieved because of Mathania chilli,” informs the chef, adding that no one can resist a bite of it, as it fills the room with the aroma of desi ghee. ■ Clean boneless mutton and wipe the pieces dry. ■ Marinate with salt, ginger and garlic paste, raw papaya paste and let it sit for one hour. ■ Mix thick curd, Mathania chilli paste, kachri paste and apply all over the meat. ■ Make some space in the centre. Smoke with live charcoal, clove and ghee in a bowl. Cover the punch bowl with aluminium foil and let it smoke for 15 minutes. ■ Mix well, put it on skewers and let it cook on charcoal grill. Use ghee for basting which will prevent the meat from going dry. ■ Serve with sliced onions.